Different environments require different audio settings for an optimal recording quality. Thanks to Voice Tracer 3400's AutoAdjust recording, the audio signal is measured to adapt perfectly to the recording environments. Recording in different environments is often a challenge, especially if you need to adapt the microphone sensitivity and record settings to fit the different scenes — which can usually only be done by manually changing the device settings. The new Voice Tracers optimised for conversations feature an innovative intelligent recording algorithm that analyses the incoming signals and automatically adjusts and selects the appropriate sound parameters, may it be Wind filter, Noise Reduction, Microphone sensitivity or L+R channel beam forming. The built-in stereo high-quality microphones produce far better and clearer recordings than standard microphones found in other devices. The recording sensitivity is increased, thus picking up more voice signal without compromising sound quality. 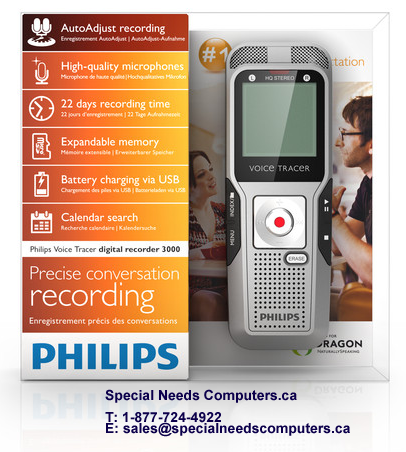 The Voice Tracer captures all recordings in stereo and the popular MP3 format, the common audio format for consumer audio storage, as well as a de facto standard encoding for the transfer and playback of recordings. A well-engineered microphone grille is able to make a good microphone stand out even more. The grille built-in the new Voice Tracer's guarantees crystal clear recordings. With the calendar search feature, finding taken recordigns is as easy and convenient as never before. Every recording receives a time stamp, and can be looked up by simply entering the date of recording. With the integrated fold-out stand on the backside of the Voice Tracer you can conveniently position your voice recorder towards the sound source. 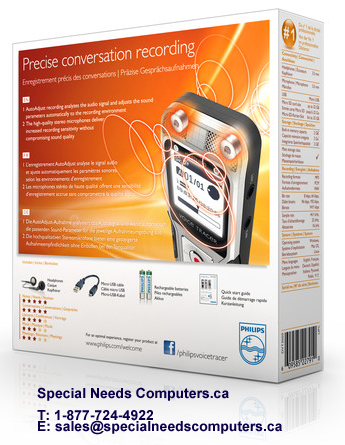 The high-resolution dot matrix display built-in the Voice Tracer's supports 8 languages and provides clear recording status information. 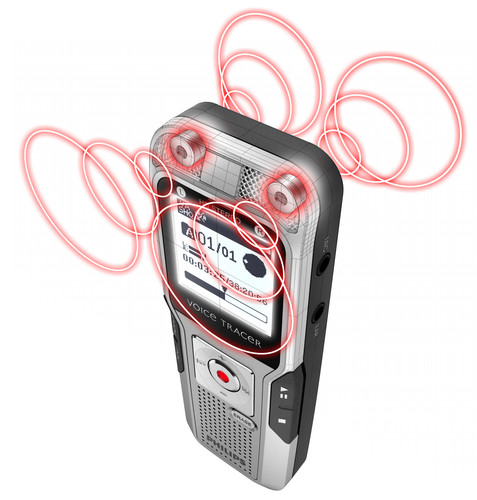 The new Voice Tracers come with rechargeable batteries for more than 50 hours of continuous recording. Additionally, you can help protecting the environment by simply recharging the batteries of your device using USB instead of buying new batteries. 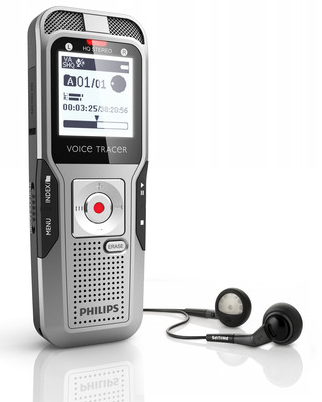 With the 4 GB of built-in memory, your Voice Tracer is able to capture up to 44 days of continuous recording. The batteries of the new Voice Tracer's last for up to 48 hours for extra long recording sessions.